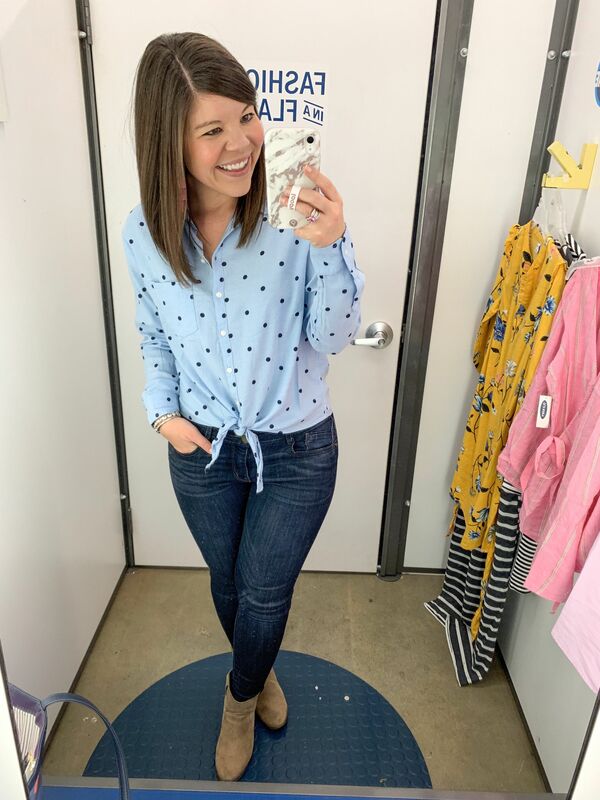 Old Navy Spring fashion is on point right now- join me in the dressing room to see a few of my favorites! Happy Monday friends! The temperatures dropped about 25 degrees this weekend and I’m piling on the sweaters and scarves for the token week of Florida winter 🙂 About mid-January I always start to get the itch to stock up on spring fashion. 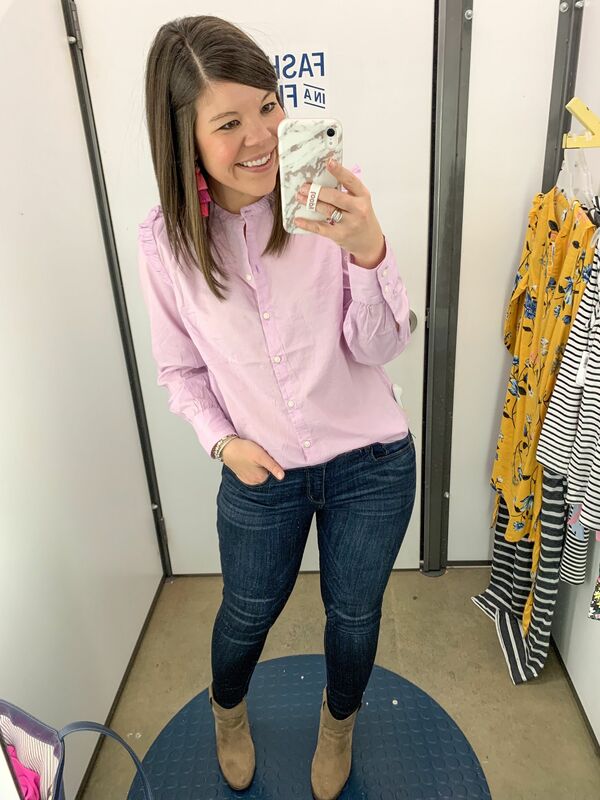 As hard as I try to fill my wardrobe with bright colors through out the winter months, there are still just way too many neutrals out there and this girl needs COLOR in her world! That’s why spring and I have such a special friendship- we just get each other! 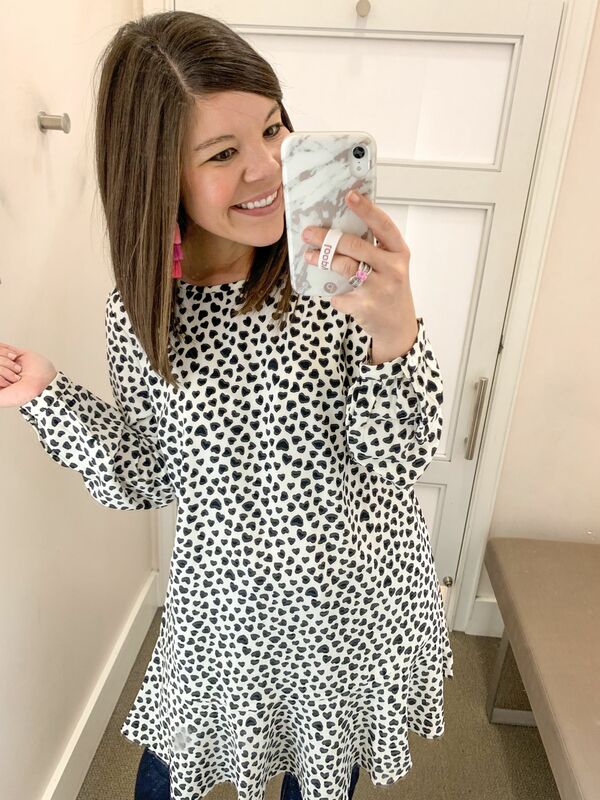 Last weekend I headed to the mall to start shopping for the upcoming season but every store was just so… blah! 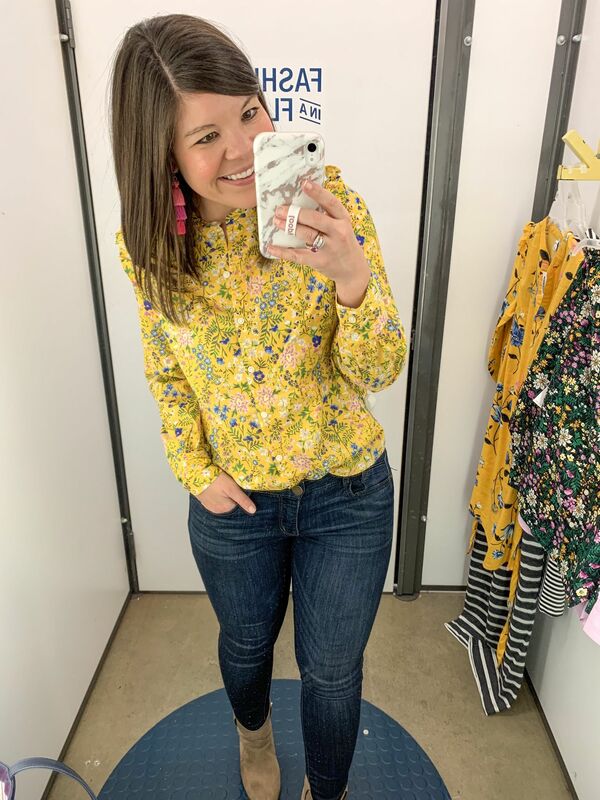 I was super bummed out until I popped into Old Navy and then my colorful heart just about burst- I was so happy to see all the great pieces they had in the store! I found so many great goodies and I just know y’all are going to love them! Before we start, let’s get the basics out of the way 🙂 I’m 5’4 (not sure of my weight- I never step on the scale! ), typically a small in top/34B, and a 4/6 on the bottom. 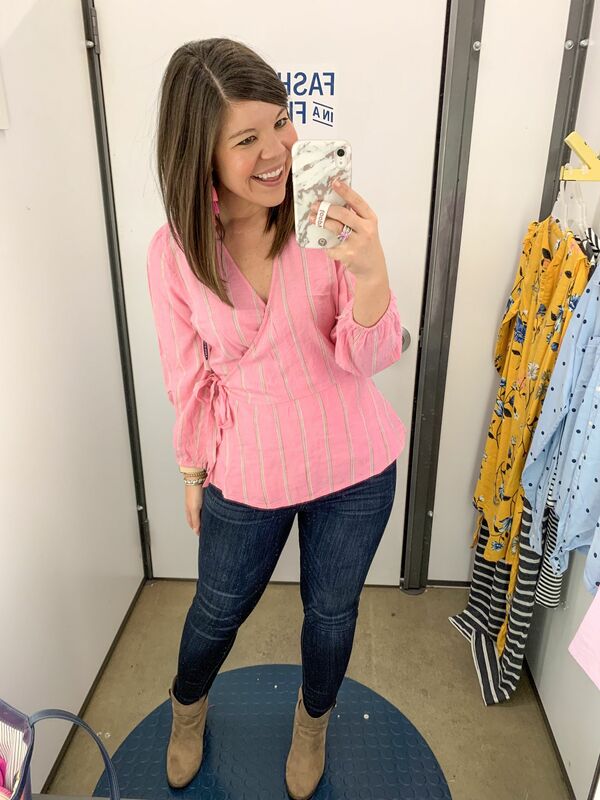 I’m a little bit between sizes right now due to losing weight on FASTer Way to Fat Loss– a good problem to have but does make it hard to shop sometimes! If you have any sizing questions feel free to reach out! 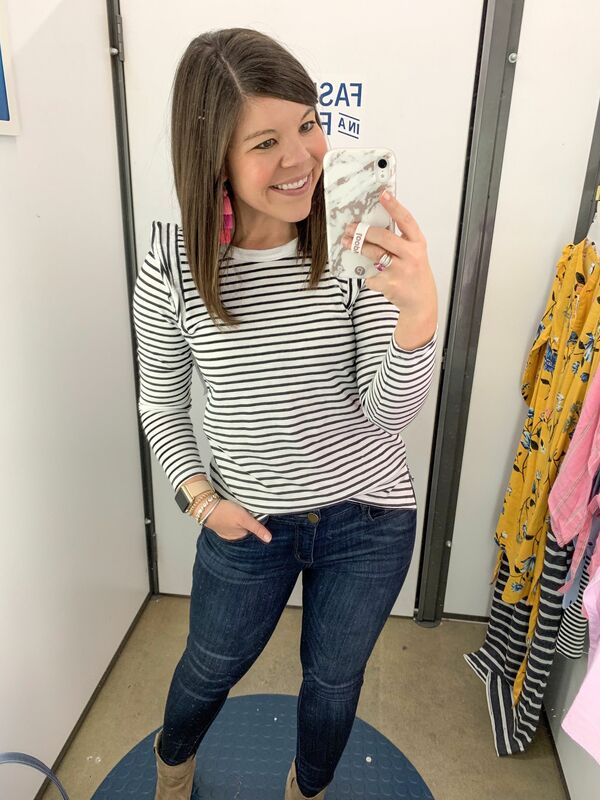 Striped Ruffle Tee– This is a basic little tee w/ something extra in the ruffle shoulders- super cute as a layering piece or tucked into a skirt! While I am wearing a size small I thought this ran a little small and would size up to a medium when I order it! 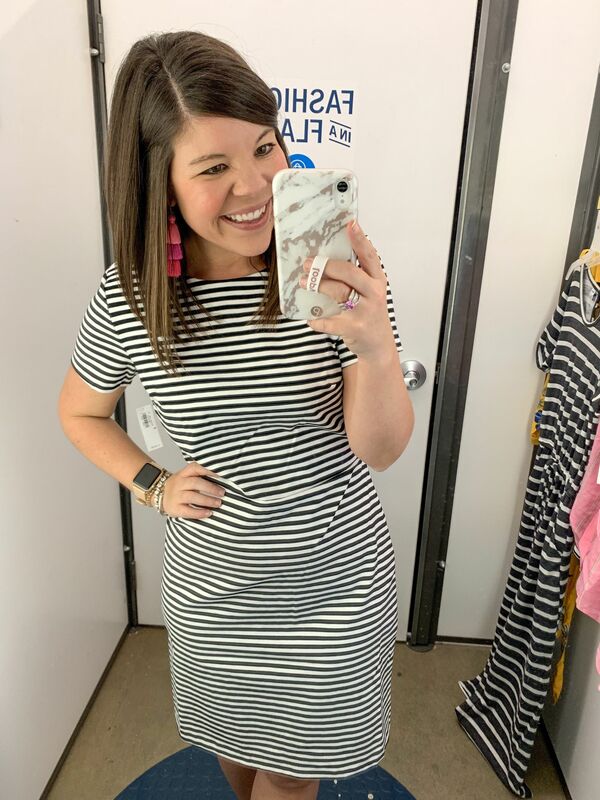 Striped Ponte Shift Dress– Thought this was such a great dress for work! Usually shift dresses run tight on my but this one ran tts if not a little big! Wearing a size medium but need a small. 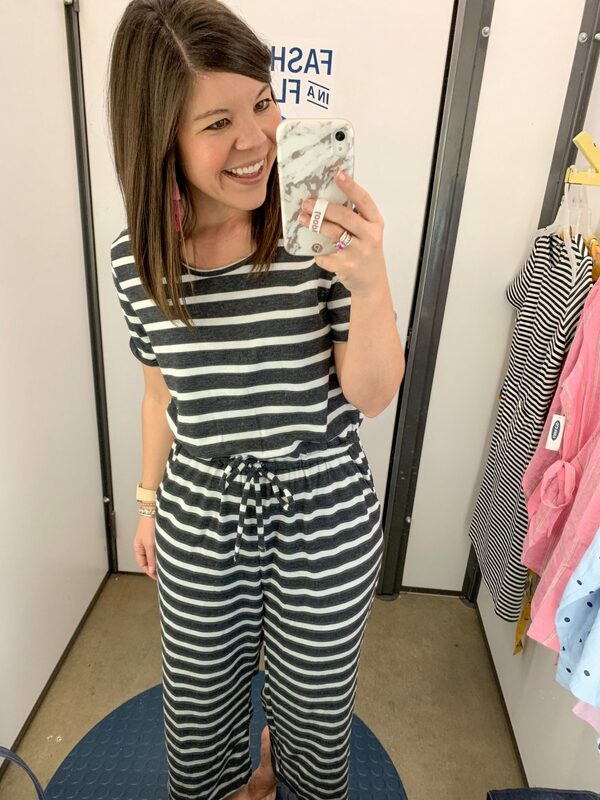 Gray Striped Jumpsuit– Love love love this jumpsuit! It’s a pretty simple design but is made of the absolute comfiest material so it feels like wearing pajamas!! Runs big though- size down. Wearing a medium, need a small. 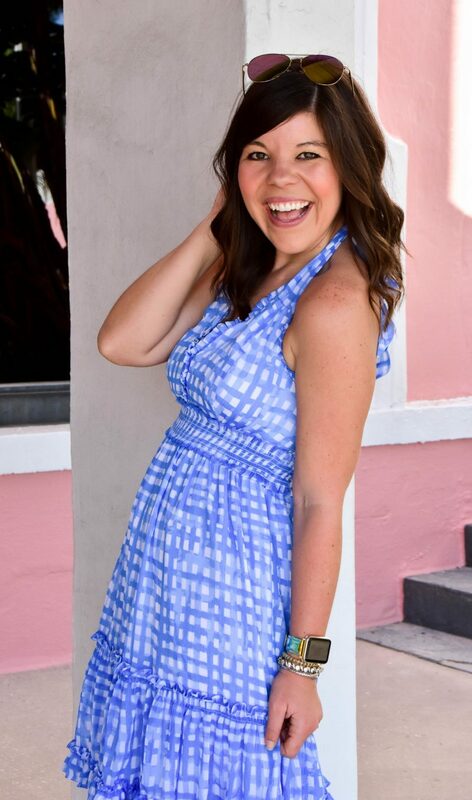 Heart Patterned Ruffle Swing Dress– Surprise! 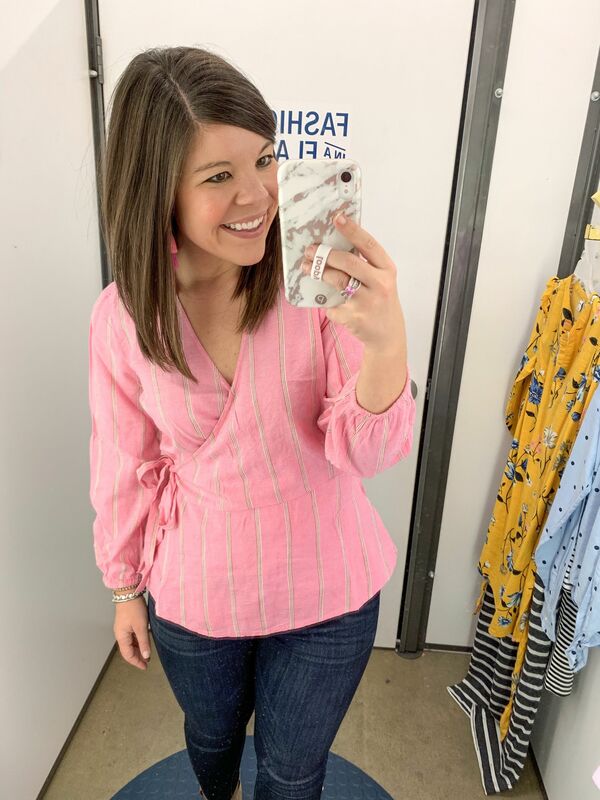 Tossing in one Loft find that is so stinking cute for Valentines day! The heart print is subtle, but still packs a punch and the swingy shape is super flattering. Runs big! Wearing small, need xs. You’re too sweet! Yes pop on over girl- and get ready to shop! So many cute. Looks like I need to stop by Old Navy stat. Love that jumpsuit on you. Yes you’ll have to stop in and let me know what you find! It’s so nice to see some color! Most people are going very neutral lately. 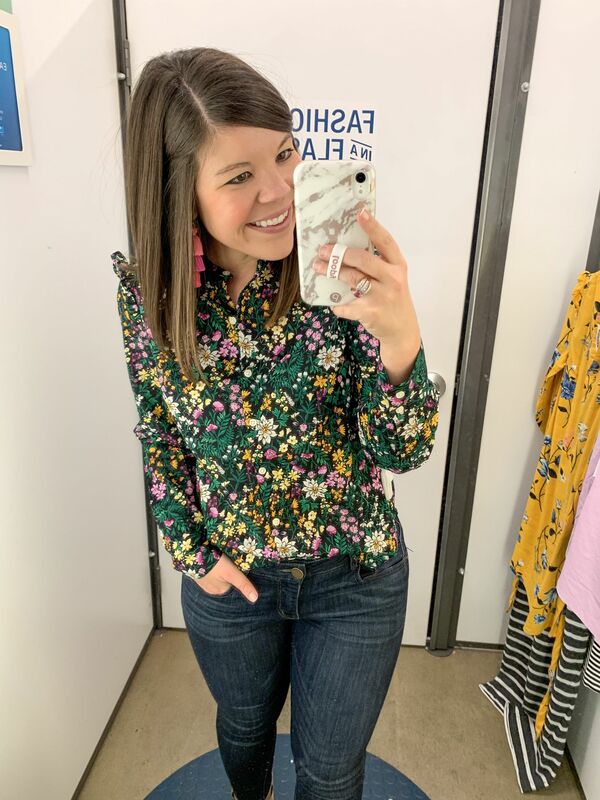 I especially love the floral long sleeve tops, they have a really sweet vintage feel to them. However, I’m positive you look great in everything! So I need to go try them on myself. Ruffle shoulders must be a really big thing this year. 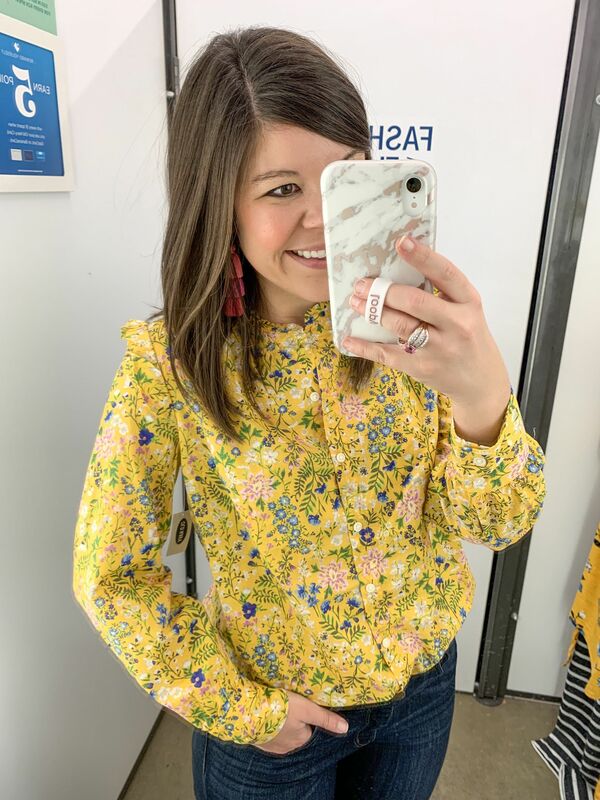 I love that you see a vintage vibe when looking at the tops- the print really is just so pretty in person! My local store doesn’t have their spring fashion in store yet, but ugh – you make me want it all! It’s all so cute! I love that striped dress! 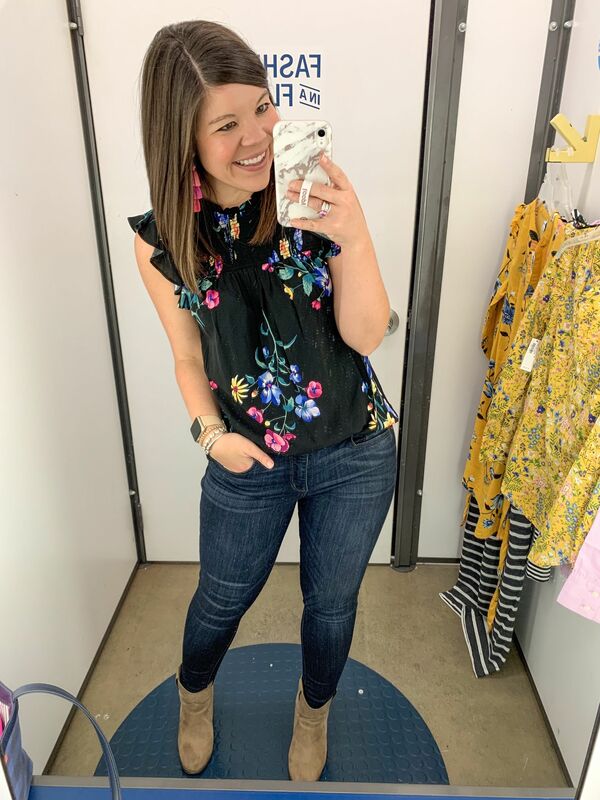 Hope you get to try on lots of fun spring fashion soon! 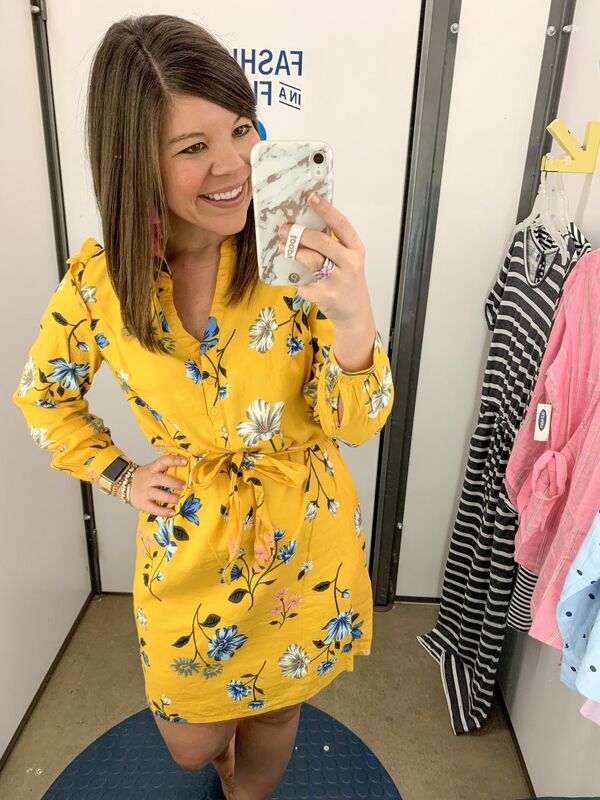 So many cute finds at Old Navy right now — very into all those florals and how good is that jumpsuit?! I’m always avoiding them because — well, potty breaks, lol! — but that’s so cute and cozy looking. I think it would be the most perfect “mom wear”! These are all so lovely on you dear, so hard to choose!